Sponsorship has never quite sat right with me. As Bloggers, we write because we love it, and because we love investing in the stories of others. I think it's a shame that so few bloggers are willing to promote each other without monetary compensation. I love happening upon a blogger who I know invests in her (or his!) writing and in her readers. A blogger who doesn't stoop to superficial link-ups and Pinterest dumps. A blogger who writes damn good content and makes me a better, more well-rounded person for having read her words. I have legitimately never missed one of Jena's posts over at Recently Roached. She is a fantastic writer and her sassy sense of humor nearly leaves me breathless. 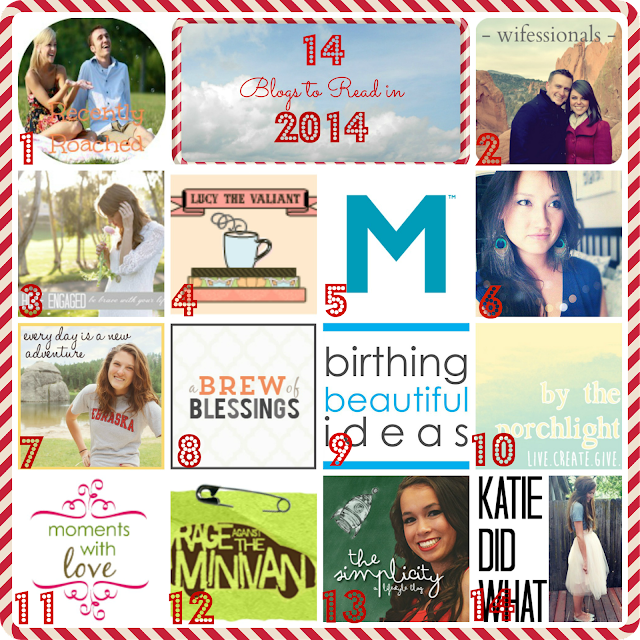 Over the last year, I've truly grown to value how much of herself Kaitlyn invests in her blog. She had one of my favorite pregnancy series and has recently started a cloth diapering series that I am over the moon about! Due to some hurtful blog backlash, Kaitlyn decided to take a hiatus but I'm so hoping Wifessionals makes a triumphant return! I can guarantee you there is no blogger out there who is quite as faithful, genuine and sweet as Katie at Hope Engaged. Her photography is beautiful, her travels, awe-inspiring, but mostly I love that Katie loves Jesus and exemplifies leading a Christ-like life. With three mini-me's to juggle and a house full of boarded high school boys, Lucy doesn't post as much as I would like. Regardless, you should absolutely visit her at Lucy the Valiant. Lucy has become one of my best Blogger friends. Something I don't say lightly. She's a fantastic Mom, an all-around over-achiever and I absolutely love her to pieces. You may know Glennon of Momastery from her book published this year titled, Carry on, Warrior. She's a "big blogger," but for good reason. Literally, everything she writes is bursting with love and inspiration. She's an excellent writer and encourages all her readers to be their best selves. Mish Lovin' Life is doing just that- loving life. And I love reading all about it! She is fun-loving and always up for an adventure. Her writing style is super approachable and makes you feel like you're sharing a conversation over drinks at your favorite bar. Don't miss her! Since having sweet baby Elsie, I haven't heard as much from Alyx at Everyday is a New Adventure. But that hasn't stopped me from following her. She's a new mama, a grad student and a kickass person. I love reading her witty remarks when she writes them! Tara at A Brew of Blessings is living a modern-day fairy tale. She met a handsome, foreign Prince and is now living the happily married life with him across the pond. Tara blogs about love, travel and has some killer style. You'll love her blog! Birthing Beautiful Ideas was a blog I stumbled upon during my post-The Business of Being Born phase. I wanted to learn as much as I could about childbirth, doulas, breastfeeding and feminism. This blog is my go-to resource. She covers it all and in a seriously intellectual, yet light-hearted way. Lesley and I are kindred spirits. We're both simultaneous wanderlusters and bookworms. Which is how I stumbled upon her blog, By the Porchlight, through our mutual love of books. She is honest, fun and works hard to keep her blog fresh and a treat to read. Moments with Love has my dream family. Nine kids born to them through pregnancy and adoption. Not to mention her sons were adopted from Uganda which is totally where my heart is. She makes being a Mom of 9 look easy, but always keeps it real and counts her blessings. You will grow to love her heart as much as I have over the years. Rage Against the Minivan has been featured on HuffPost and is plain and simple, kind of a big deal. I think I found her blog while seeking out adoption-related blogs and just fell in love with everything she posts. While she writes about adoptions occasionally, she also regularly comments on current events and features women suffering from pain pill addiction, miscarriages and abuse among other things through her What I Want You to Know series. Excellent reading! The Simplicity (a blog by Kimberly Erskine) tackles it all. She talks about her marriage and thoughts on babies. And within the same week, will write a kickass post about her feminist beliefs. She's not afraid to tackle tough subjects and always stays true to her voice as a writer. I loved following Katie from Katie Did What to see her stellar style, weekend favorites and workout tips. But when this cutie patootie announced she and her husband were expecting, I couldn't get enough. She is precious, has the rare ability to write about the good and the bad with beauty and grace and is just one of those girls you'd want to be real-life friends with! Ok...we are bound to be friends because at least half of these blogs are my favorite to read and the others I'm now going to have to look in to! :) Happy 2014! I love the idea of this. I ventured into sponsorship a little bit and just didn't like it. I would love if bloggers just shared stuff because they like it. I wrote a post about that a while back. I try to share things I like, but I admit...sometimes I forget. I'll try not to get on my soapbox, but I feel like blogging has been very "blah" lately. It seems like my newsfeed is always full of sponsored posts or giveaways. I read very few posts these days. I'll be checking these blogs out to see if I can find some new content filled blogs to follow. Thanks! Oh my god!!! How did I not see this post earlier?! THANK YOU SO MUCH! You are so kind. I absolutely love this post. THANK YOU!!! A blog slacker like me does not deserve a spot on this list of awesomeness, but thank you!! You're one of my favorites, too!